You are here: Home » The real Bill Shorten, Kathy Jackson HSU fraud story. Where’s the missing $15million? The real Bill Shorten, Kathy Jackson HSU fraud story. Where’s the missing $15million? The HSU fraud saga is one of those triple backstab type situations where the corruption continues today under the watchful eye of current National President Lloyd Williams and National Secretary Chris Brown. Put simply, Michael Williamson, Kathy Jackson, Craig Thomson and others had been involved in major fraud for years ripping off HSU members millions of dollars. Kathy Jackson decided to have a power grab and tried to oust the other crooks and thieves. Jackson had success in destroying Williamson, Thomson and a few others and for a while was hailed as a whistleblowing hero taking on union corruption. Bill Shorten saw this and did not like it so he manoeuvred to have his own union crooks and thieves take over from Jackson. Shorten had a first go in the 2009 HSU elections and tried to oust Jackson by running a ticket headed up by Diana Asmar and supported with funding by the AWU and other unions. It failed. So in May/June 2012 Bill Shorten used his position as Minister for Employment and Workplace Relations to put the HSU into administration and appoint an administrator which cut off Kathy Jackson’s cash flow and made it near impossible for her or her allies to compete in the subsequent 2012 HSU elections. The fraud and theft that currently goes on at the HSU by Shorten’s crime gang has gone unreported besides this website and people on social media. But the Trade Union Royal Commission is investigating and Diana Asmar and Co should be back in the witness stand in a few weeks. Union whistleblower Kathy Jackson has been called almost every name under the sun over the last few days since the $1.4million judgment against her for stealing from the Health Services Union (HSU). While most of the names such as fraudster, thief and hypocrite are fair and reasonable, credit also has to be given for Jackson’s whistleblowing as it saved millions for HSU members. If she had not blown the whistle massive fraud would be continuing by Michael Williamson and others at the HSU. Although it hasn’t stopped Bill Shorten’s crime gang. So while Jackson should not be given the standard credit most whistleblowers receive she should get some credit. There has been a huge effort, while the Royal Commission has been in progress, by the Labor Party and the Unions to put the focus and responsibility on Kathy Jackson for most of the Union corruption. While that might have worked at times to distract some media it won’t work at all from now given this week’s judgment against her. It is interesting that Labor and the Unions try and use Kathy Jackson in an attempt to embarrass Prime Minister Tony Abbott because he once praised Kathy Jackson for blowing the whistle. Yet it was Bill Shorten who was long-term friends with Kathy Jackson while she ripped off the Union. Their friendship dated back to their university days and apparently continued up until 2007 when they had a falling out. While Wicks knows a lot of the history he will never write the full story because he is a Labor boy. In November 2013 Wicks wrote an article about the continued corruption at the HSU by Diana Asmar and Kimberley Kitching etc. but pulled the article down after a threatening call from Bill Shorten’s boy Andrew Landeryou. Fortunately a reader sent me a copy of Wicks’ deleted article (Click here to read) which raises an interesting question. What happened to the missing $15million? And: “Many also claim that during the campaign new members were told they would be given $2,000 if Asmar secured the role of Secretary, they are wondering what happened to the money they were allegedly promised” Why is it that wherever Bill Shorten goes vote rigging or fraudulent election practices happen or are alleged? If they planned on stealing $15million they probably thought it was worth taking the chance and lying to people about the $2000 payment. By the time people complained about the $2000 payment the $15million would be long gone. The $15million or any part of it was never raised in the 2013/2014 HSU Victoria Number 1 Branch accounts which I analysed in a previous article. (Click here to read) So where is it? Or who’s pocket is it in? We rightly say Kathy Jackson is a fraudster, thief and hypocrite over $1.4million. So what do we call Bill Shorten and his crime gang over the missing (stolen) $15 million and millions more I exposed in an article back in February. (Click here to read the article) The total could easily be over $20million. The real Bill Shorten, Kathy Jackson HSU fraud story is just starting to be exposed and there is plenty more to come and that a major reason Bill Shorten wants the Royal Commission closed down. Admin: You won’t read the above article (which is clearly in the public interest) anywhere else so please read below and support this site as it struggles to raise regular funds to cover costs like most online sites. What a bunch of rip-off merchants these bloody unions are. Poor old worker cops it in the neck every which way. The Royal Commission must continue and all criminal activities must be pursued by the Police. None of these people would have had the ability or the opportunity to carry out the crimes committed without lots and lots of help. As I said before, a Federal ICAC will have a lot of fish to fry on both sides of politics……being it on! None of those convicted of such crimes deserve to have any future in public office, ever! Agee with that Con, a Federal ICAC is required to clean these parasites out. What sort of auditors don’t pick up on this theft, or are they also getting a kick back to keep quiet ? The 9 Million which is missing after the deal Michael Williamson did is that involved with the 15 Million in this Post? Or is this a separate matter? Amazing how here are Millions everywhere, and the poor workers do not have anything in their pockets. When are these worker waking up, that thy are being done like a dinner? What will follow me to my grave is why knowing the Labor Party and the unions are nothing more than common thieves with a paranoid envy complex people will still vote for them. So called ‘workers’ are defrauded, cheated and treated like fools yet will still vote Labor. I can only think that a large section of our population actually like being treated this way, I have no other answer. I have a personal example, my brother in law, will vote Labor even if they sent him to the gallows. His opinion is that because I took a huge personal financial risk and started my own company I am not a ‘worker’ It’s this type of brainwashed individual that keeps Labor going. I remain in a state of puzzlement. Condolences Saxon. I have a few ALP voters in the family so I know how you feel. We should think of them as simple-folk I suppose and love them despite their faults. I also have a friend who would never vote anything bar labor, if asked to put his neck in a noose, he would do so. It’s a worry. As a former employee of the Commonwealth Government, it was clearly explained that in the event of a crime being committed and found guilty, we would be dismissed without any remuneration of any kind. This included superannuation and dismissal pay. I trust these mongrels are also included under that act.! You know, we only make decisions on the information we have. So whether your true blue Labor, Liberal, Greens or whatever….. surely one’s mind set should always be for truth. Any politician who doesn’t understand that simple principle should get out now! Having a dig at one political party exclusively undermines the argument. I think I will vote Labor in the next election and join the Labor party and shed the burden of being a loyal conservative for all of my sixty voting years. Of all the countries I have resided in the last 78 years this is by far the worst democratic and corrupt system I have experienced, it is a JOKE. There are politicians and union bosses running around completely oblivious to the law, stealing money from the fools who think they being helped, as far as I can recall there are two people that have been caught with their dirty hands in the till and there are dozens we know are guilty of fraud theft corruption sexual crime against minors and adults back stabbing elected Prime Ministers and they are all walking free with the expectation of a pension you cannot jump over. I think the anguish with the system, indicated by comments above, justifies my real concern as to where this country is heading. My fear is that the word Communism seems to be deliberately hidden in the term left wing. Are the communist type thinkers embedded in the Fairfax press, the ABC, and hiding within the Greens and labor ranks? I believe that Australians are basically socialist and as a consequence accept all things Labor. I am probably on my own here, but I never hear the term Communism mentioned anywhere. Am I on my own here, or just delusional ?? G’day Frank, no!! definitely not the only one. I have used the term Fabianism in other posts, as I am able to see this country being sold off to other countries in leaps and bounds. Look at all the “PUBLIC” utilities, owned offshore. Look at all our engineers, sold out to work from overseas, Note the supermarkets among others, less manned checkouts now self serve checkouts, more and more people being laid off for greater profit. What happens when there are no people employed, where will the money come from to go to the supermarkets?. Farmers being forced to plow in their crops because the same supermarkets are importing everything.cheaper……. Where do I stop? What do the poor older people do for a crust? If you are over 40 years of age, who will employ you?, yet we must work until 70 years of age now….HOW? I am afraid this country will be forced into a civil war before too long, rich and powerful against the poor, guess who will win. Enough from me for now Frank, but do not think you are the only one thinking the way you do. There is evidence that there has been a systematic undermining and rorting of the Commonwealth of Australia and of its once CLEAN Judicial Status. We do need for the Commonwealth of Australia to fund an Independent Fraud Office to proactively investigate and provide remedies and restitution for all reported instances of Frauds if perpetrated by and or if it involves any of our past or present Politicians, Australian Public Service Commonwealth Public Officials, Unions, Ombudsman, Attorney-General’s, Solicitor-General’s, Governor-Generals, Judiciary, or any Court Registry Officers, Police, and or any past or present Public Funded Agents, Officers, Officials and Servants WHO are believed to have undermined, rorted and or manipulated OUR Judicial Systems and or OUR Policing Systems and or OUR Financial Share Sale Requirements in Abuse of Public Office and or in Abuse of Trust; as such rorts do erode Public Trust. Without any independent Fraud Office strategic department prejudices are being perpetrated against not just a minority, and which wrongdoings are generally akin to strategic acts if intentional forms of fraudulent Insider Trading Frauds. Frank, the USA used the boogie man “communism” term from the 1940’s onwards and made sure most western countries followed their lead ( no matter what), but when the USSR dissolved in the 80’s the world could see that their alleged military threat was nothing more than a “construct”…..no truth. Here too, the issue remains local and remains in the heart of the individual. We need politicians who are not afraid of the truth- even if it distresses other countries, powerful or rich people or establishments in our society. Truth, not lies. Kathy Jackson is a thief and a fraudster over the $1.4 million she stole. But why is the mainstream media and more importantly the labor party/unions are focusing on her?. Well I will tell you why, the labor party & the unions are protecting Bill Shorten and others from being exposed for his many crimes. They are defaming Justice Heydon of the same thing, so they can protect Shorten and others. The labor party/unions want this Royal Commission shut down because they are truly scared of what might happen between now and the end of the year. The $15 million that has been stolen from the HSU has in my opinion has gone straight in the pockets of Bill Shorten’s crime gang. Shorten’s criminal gang had no interest in serving the HSU, their main focus is stealing the money from the HSU and getting rich at the expense of the members. They are also there to strengthen Shorten’s power base in the HSU, the unions & most importantly the labor party. As for Kathy Jackson, she still has my gratitude for exposing the theft & corruption in the HSU committed by Williamson, Thomson & others. 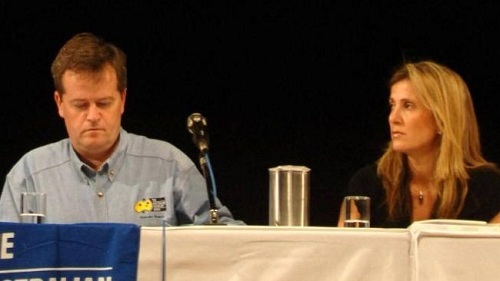 Kathy Jackson is one of the main reasons why we have a Royal Commission into the unions. Whatever she did herself she is still a whistleblower who she & her family suffered horribly by the labor party, Craig Thomson, Michael Williamson, Bill Shorten and many others. Kathy Jackson & her family suffered by these labor party/union crooks and that must never ever be forgotten. Straight out the Mafia handbook . What has the ALP come to………………………….?. ” Overlooked ‘ appears to be the new buzzword of the Left leaning. This comes from Mr Cassidy, the host of Insiders. Because this word was used by Mr Heydon AC/QC in his defence appears to be the Left’s call sign. Oh me, Oh my, I would say Kathy Jackson has been set up to take this fall from grace. I don’t know the big wigs name who defamed her, as we know most courts are corrupt. Wow he actually said in an interview last week that how dare anyone put down the HSU, he said this with a smirk on his face, and referring to Kathy Jackson. Humm what was his name. Keep your head up Kathy, you are a good honest person, thankyou for taking the stand and whistleblowin. Most people are to gutless to blow the whistle. So in my eyes anyone who see’s any corruption or abuse and doesn’t blow the whistle is just as corrupt. The issue of the $15m is a pretty simple one and the answers are widely available. The money is in the hands of 45,000+ workers it was allocated to. $1m was allocated to mental health workers and the remaining $14m was allocated to public hospital workers across 86 hospitals/services via a variation to the agreement. You really should do some basic research before making wild defamatory allegations about missing millions. On the issue of Jackson, if you are suggesting the banks, courts, members of the committee and many others collectively conspired to bring down an honest whistleblower you have a very creative imagination. What can’t be disputed is that current HSU management are conspiring to cover-up the current fraud and theft happening at the HSU Victoria Number 1 Branch. Just like they did for many years when Williamson was in charge. Each branch has complete political and financial autonomy. If there was theft at Vic 1, and I am very confident that there isn’t, the body that must deal with it is the Vic 1 branch committee. That is, the body elected to represent the members and ensure things run properly. This committee has access to all relevant documents and has the power to launch investigations etc. You say: “If there was theft at Vic 1, and I am very confident that there isn’t”. When you write that you are doing nothing more than trolling. Everyone knows there is massive fraud happening there as the financial documents show and fraud and theft from Unions is the specialty of the Asmar’s, Andrew Landeryou and Kitching. To top it off both Diana Asmar and Kimberley Kitching have been caught perjuring themselves at the Royal Commission and the Fair Work Commission and the RC has recommended criminal charges against both of them. And that is why the Royal Commission is still investigating Diana Asmar and Co. In a few weeks we will all see what the Royal Commission has uncovered on top of the fraud that I have written about.